The TLP4BK Surge Suppressor from Tripp Lite has 4 side-mounted outlets (including 2 transformer-friendly outlets), a convenient direct plug-in design and diagnostic LEDs. The unit has a surge suppression rating of 720 joules to handle the strongest surges. 720-joule surge protection rating – More joules mean more protection! 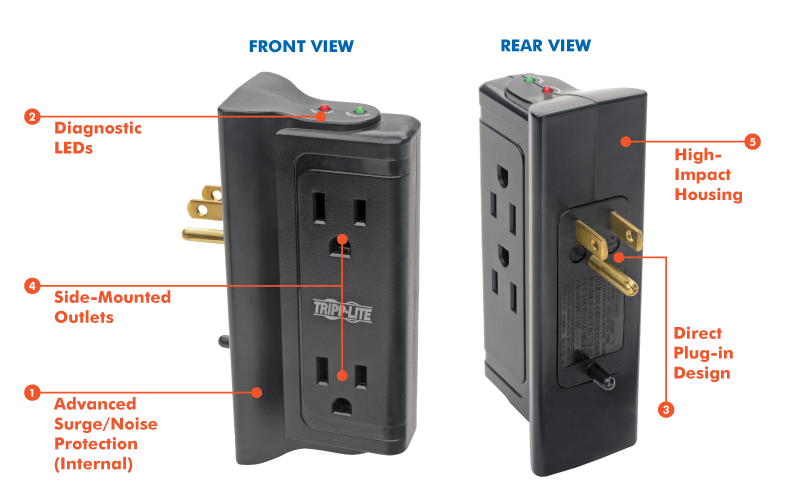 This surge protector is perfect for home and office electronics of all kinds, including computers, monitors, printers, wireless routers, televisions, video game consoles, streaming media players, device chargers, desk lamps and small appliances. If your connected equipment is damaged by a surge—even a direct lightning strike—Tripp Lite will repair or replace it up to the value of the Ultimate Lifetime Insurance. If the protection status LED ever goes out, simply return the surge protector to Tripp Lite for a free replacement. And if you ever have a question, our Chicago-based tech support team is standing by ready to assist you free of charge.